After Saturday’s game, Mono and Simeone bent down and roared at each other. They played together, and they’ve been coaching shoulder-to-shoulder since 2011. Their team that didn’t look like a Spanish champion set your preconceived notions on fire and won the league anyway. On Saturday, Atletico Madrid fought back from a 1-0 deficit against Barcelona, in the Camp Nou, to earn a 1-1 draw and clinch the club’s first La Liga title in 18 years. Despite first-half injuries to Diego Costa and Arda Turan, the team scrapped back, ceded possession, and defended like rabies-infected terriers — much as it has all season, much in the image of its coach Diego Simeone. El Cholo is a genius motivator, a consistently brilliant tactician, and BLAH BLAH BLAH. Keep drinking that Kool-Aid they’re handing out. Enjoy the Cult of the Manager. I’ll be over here, bowing at the altar of the Succulent God, Mono Burgos. Mono Burgos? Who is Mono Burgos, you say? Oh, he’s just the bear-shaped assistant coach threatening to rip off Jose Mourinho’s head. Can’t you see him? He’s right over there, sitting on the bench, wearing Google Glass during a real-life, competitive soccer game because you better damn well believe that the Church of Mono (a close affiliate with the Church of Westbrook) has decided to embrace the advances of modern technology. Mass is every Sunday on the sideline of the Vicente Calderon — and DON’T YOU DARE TRY TO INTERRUPT HIS SERMON, SON. 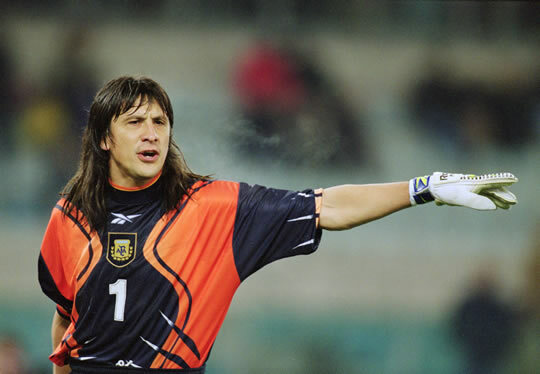 Born German Burgos in Argentina in 1969, he gained the nickname “El Mono,” or “The Monkey,” because of his long hair and his oft ill-fitting uniform. Funny — sounds familiar, doesn’t it? Mono played close to 200 games in his home country before moving to Spain. He went to two World Cups with Argentina, but never left the bench in either one. And yes, you are right to assume you’ve never heard “lack of Mono” given as a reason for Argentina’s early exit from the 2002 World Cup because Monoism doesn’t have time to reiterate those truths we hold to be self-evident. Some say Mono was a goalkeeper. Others realize he was protecting something much more than a goal. Cancer once tried to test Mono, and it failed. When Nietzsche said, “Without music, life would be a mistake,” he was talking about Mono Burgos and his tambourine. After Saturday’s game, Mono and Simeone bent down and roared at each other. They played together, and they’ve been coaching shoulder-to-shoulder since 2011. Their team that didn’t look like a Spanish champion set your preconceived notions on fire and won the league anyway. It’s title no. 10 for Atletico, who, just 12 years ago, were only gaining promotion back into La Liga. Their goalie that season? Mono Burgos.